John Forman, trading coach and author of The Essentials of Trading book and blog has recently put out a promising new resource for traders. It's the New Trader FAQ's book. Through his coaching and his blog John has gained extensive experience working with beginning traders. In putting the book together John first compiled a huge list of questions most asked of him by beginning traders. They include topics related to such things as education & learning curve, trading mechanics, analysis, systems, trader psychology, brokers, and trading careers. Rather than just answer all the questions himself, John was able to get 11 other trading professionals to offer their perspectives. You'll no doubt recognize many of the contributors. I'm pleased to say I was able to contribute a small part to the effort. I'm even more pleased at how well the whole book came out. John truly did a terrific job. And while the intent was to help beginning traders with informative and diverse answers on a wide range of topics, I'd have to say John overshot his goal. You don't need to be a beginner to gain something from the book. So if you're looking for something to read this long Memorial Day weekend, you may want to check out the New Trader FAQ's. John even lists all the questions on his site for those who would like more detail. Should this morning's gap hold until the open we could see a short-covering rally ensue. You should note, though that drawdowns have been sizable in several instances (last column). I've market the original study date on the chart. Up to that point there had only been 2 out of 12 instances that rose the next day. Since then it's been a coinflip but the gainers have strongly outsized the losers. In the original post I listed all of the instances up to that point. Below I have listed all the instances since then. Market behavior is always evolving. It is important to continually monitor edges to make sure they are still providing an edge. This is something I constantly do in the Subscriber Letter. Over the last year and a half since I first published the study the market has: 1) Shown a much greater inclination to experience these late-day market surges. There have been more instances in the last 2 years than in the previous 25 years. 2) With the market more inclined to experience a surge, it's meaning also seems to have changed. It no longer seems to suggests a downward edge for the next day. Yesterday's huge selloff caused the CBI to spike up from 4 to 17. In the past I’ve discussed how a CBI of 10 or higher has typically been a good long signal. I’ve shown that a trading system that went long when the CBI hit 10 or higher and then sold only when it had dropped back to 3 or lower showed a very favorable edge. Below is an updated list of all instances since 1995. This is an extremely oversold level. 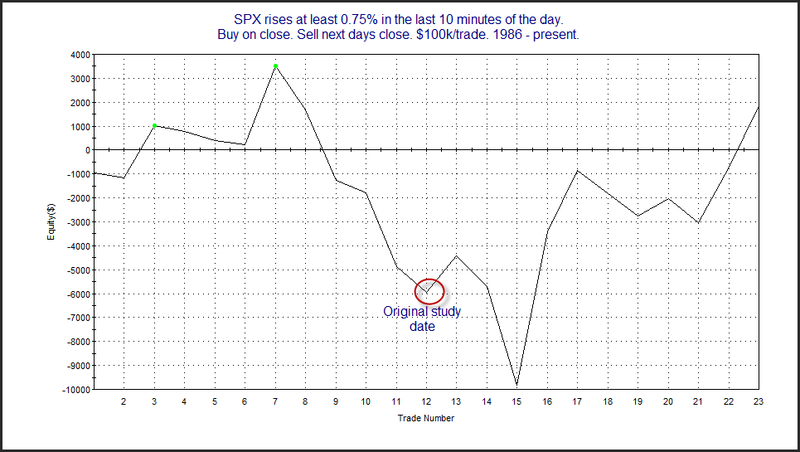 Ten and above has often led to market bounces. Not always immediately, though. It got up into the 40's in July 2002 and October 2008. Lots of different ways to look at this morning's gap. Here's one with results typical of what I'm seeing. Below is a study that appeared in last night's Subscriber Letter that looks at Tuesday's volatile action. 1) While results are explosive, instances are very low. Rather than including this among my Active Studies List I have simply decided to track it going forward. 2) Without the 200ma filter the results are no longer bullish. 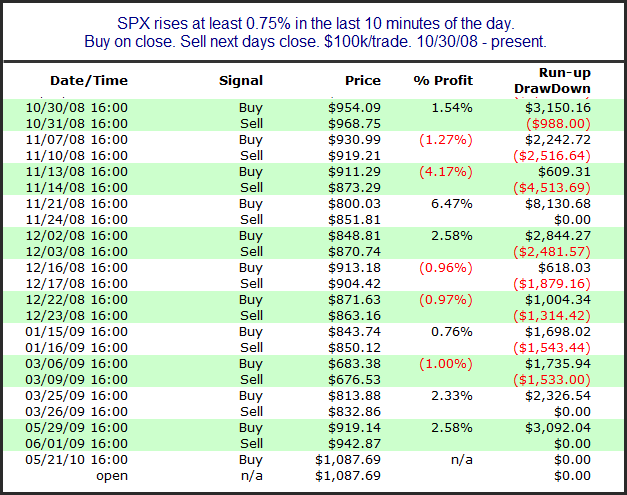 There were some big declines followingthis type of action during a downtrend. Breadth that was so extremely negative as was seen on Friday is rare. It is especially rare when the market is not already downtrending and reaching oversold levels. The NYSE Up Volume % of 4.5% suggests nearly everything was being sold. Indiscriminate selling like this hints at panic. Below is a study last shown on the blog on February 5th that exemplifies this. Instances are low, but with all 7 bouncing in the next day or two I believe it’s worth noting and perhaps considering now, and then tracking going forward. As of now the market is gapping up very strongly on bailout news. SPY is up over 4% as I type. 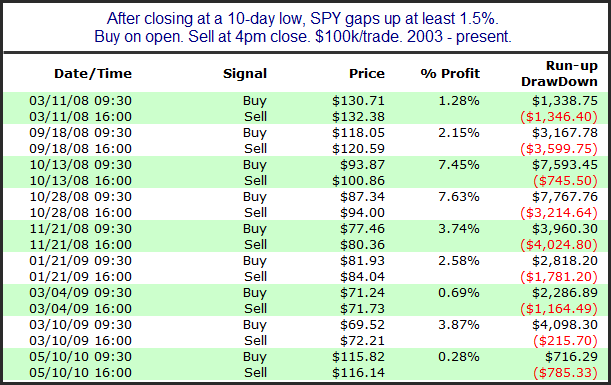 I looked back to find other instances of monster gaps and how the market behaved on those days. For this study I required the gap to be at least 3%. Results below. Only 4 instances make it dangerous to draw any solid conclusions. I'll let readers do their own interpretations. I would note that all 4 instances took place in September or October of 2008. What struck me most about Wednesday’s action was the fact that the market closed above it’s open but still down on the day. This little pattern can be bullish under the right circumstances. It will often signal a reversal after there has been a move down. I showed a few studies related to this in last night’s subscriber letter. Below is one. This simple pattern suggests a bounce appears likely. As probably 99% of the people who read Quantifiable Edges are aware, the Traderfeed blog, written by Dr. Brett Steenbarger is nearing an end. Over the last several years Dr. Brett’s provided a wonderful example for traders, bloggers, and service providers. The energy he put towards the blog and the rest of his work was astounding. His posts were consistently thought provoking and provided many sparks for further research on this site and others. And he’s done it with the kind of integrity not often found on Wall St.
Quantifiable Edges would have come to be without Dr. Brett. But without his inspiration, support, and encouragement throughout the last few years it certainly wouldn’t be as far along as it currently is. Any blog readers or subscribers who have benefitted from my work should be aware that some credit needs to go to the good doctor. Of course that’s just one small example. Thank you Dr. Brett. Congratulations on your new endeavor. Whoever convinced you to join their firm will surely benefit greatly, just as so many others have over the years. While you will soon be silent on the internet, I look forward to eventually hearing of the good things you’ll accomplish in the next several years. Monday is the 1st trading day of May. I’ve discussed many times before how the 1st trading day of the month tends to be seasonally bullish. Last July I showed a chart breaking it down by month. May has been one of the strongest months, both based on total return and % profitable. 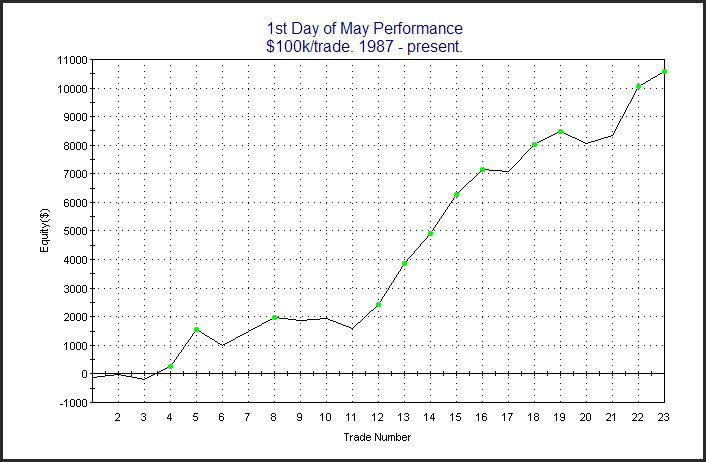 Below is a graph showing performance on the 1st day of May since 1987. 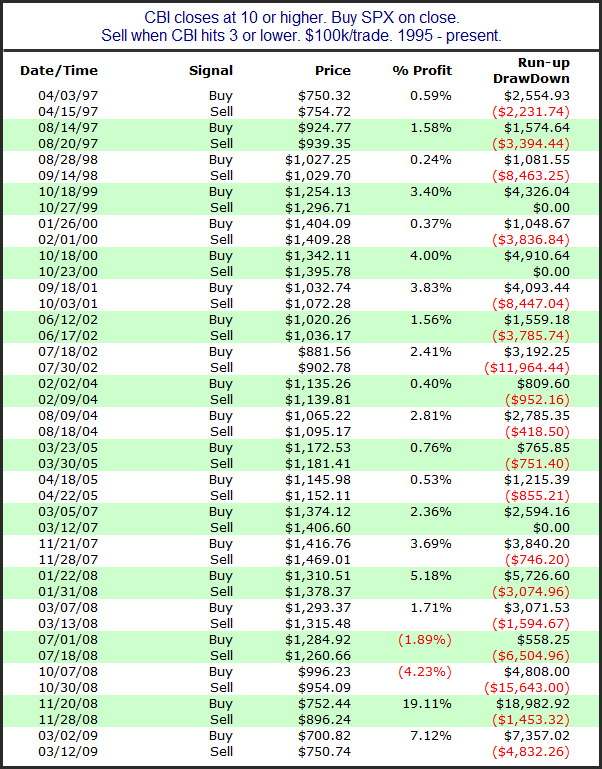 Also notable is that 22 of the last 23 years the SPX has closed above the final April close on either the 1st or 2nd day of May. 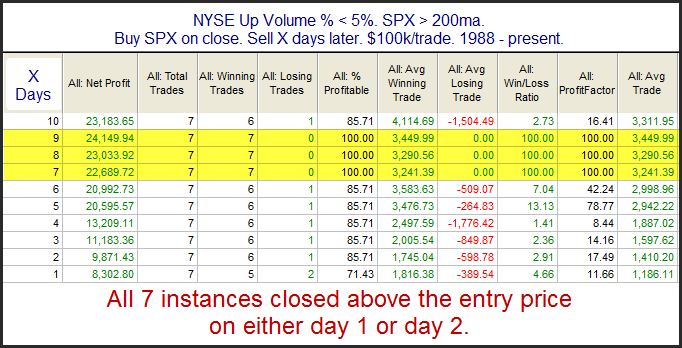 The lone exception was 1989, which lost a total of 0.5% over the 2 days.